The DA50L-A-STROBE is a wireless entry alert kit specially designed for business. The PIR motion sensor mounts inside the door and instantly detects visitors as they pass through the doorway. The sensor immediately transmits a wireless signal to the included receiver that plays a chimes sound and flashes a bright strobe light. The DA50L-A-STROBE is a Commercial Grade Wireless Entry Kit designed specifically for warehouses, shops, stores, and stores that trigger when someone passes through a monitored zone. When the combination of heat and movement are detected by the state the art PIR motion sensor, it transmits a wireless signal up to 500 ft. (line of sight) to the plug-in receiver. This kit features a strobe light (pick a color!) that flashes when motion is detected to provide a visual alert to accompany the chime sound played by the plug-in receiver. The kit consists of the DA50L-A wireless business grade entrance alert, a strobe light, and 18AWG wire. The included strobe light wires into the back of the receiver on the 2 x 12V DC outputs. When the sensor detects motion, the receiver sends a live 12V output to these terminal screws to power the attached strobe light. This adds the benefit of a bright strobe light to provide a visual alert to users. In some situations your warehouse or shop may get noisy and the bright flashes strobe adds that extra notification needed in your work-space. Alternatively, you may work in a quite environment. Not only can your turn the volume down to the desired level, you can also turn it all the way down and use the strobe light to provide the alert signal. Why Use a Motion Based Sensor for a Business Entrance Alert? Many customers want a sensor that only activates when the door is actually opened. These systems use a magnetic door/window contact that trigger the system when a door is opened. A common problem many users face in these situations is that the metal surrounding a commercial door (common in commercial applications) or the brick, stucco, & concrete severely interfere with the sensor trying to transmit the radio signal. The PIR sensor & transmitter featured in this kit overcomes this problem by the simple fact that it does not mount on the actual door frame. 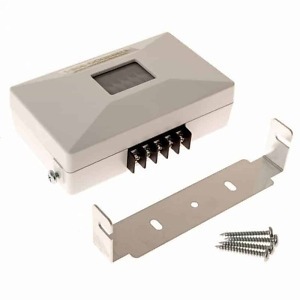 This sensor will mount above the door or entrance you would like to monitor. The mounting kit provides an easy way to mount the sensor and point the invisible PIR beam straight-down into the floor so that it virtually covers the door opening only and does not pick up passerby’s. As a matter of fact, most of our customers angle the beam into the door so the beam does not bleed out into the hallway. If you want a door / window magnetic solution (triggers ONLY when the door opens) we recommend the LH-4000 5,000 ft. Long Range Entry Alert kit. With a 5,000 ft. range, this product easily overcomes obstacles found in commercial applications common products cannot. Another common use of the DA50L-A-STROBE is when the door doesn’t typically stay closed. This also makes the product great for monitoring hallways, shop areas, or other areas of restricted access. Transmitter is powered by 2 x AA Alkaline batteries (not included). Average battery life is 12-24 months prior to changing. Receiver has four zones, with each zone able to play a unique sound. The transmitter is a PIR (passive infrared) motion sensor. The invisible PIR beam comes out of the sensor in a canonical-type shape. The higher the sensor is mounted the lager the coverage area. For example, mounted at 8 feet high, the cone will be apprx 6′ wide x .83′ deep, while mounting it at 10 feet will provide a 8′ wide x 1′ deep monitored zone. The transmitter features a mounting bracket that allows you to rotate the sensor up to 270 degrees. For additional information about the transmitter/sensor and the receiver, please visit the DA50L-A product page.